Back in April, I mentioned that I wanted to lose some weight. At the time, I was 16 stone, 12.5 pounds. That’s 236.5lbs, or about 107 kilos. I procrastinated for a bit, I had a couple of false starts, but then I got on, and stuck to, a restriction in my calories for a good few weeks. I kept myself mostly on the straight and narrow for about five weeks. My plan was to last out for eight weeks, but the cold/flu/whatever that I caught in a while back — and that I’m only just getting over — sapped some of my willpower, and I’ve gone back to mostly “normal” eating for the last couple of weeks. Because I’m feeling better, I was thinking about re‐starting the diet. Because it was on my mind today, I figured I’d actually get on the scales for the first time since April. I decided not to be a slave to the number on the scale, so I’ve not been weighing myself, just trying to eat more sensibly and not go overboard on treats. And it seems to be paying off. As of a few hours ago, I was 16 stone, 5 pounds. That’s 7.5 pounds down, more than half a stone — about 3.5 kilos — gone. So, assuming I can keep that off until September, that’s half a stone of fat I won’t be having to drag thirteen miles around the half‐marathon course, which can only be a good thing. My plan was to lose 20 pounds by September, which is now looking a little ambitious, but I’m a third of the way there and there’s still a couple of months to go, so I reckon I’ve done pretty well. Also, this is just the most recent bit of weight I’ve dropped since I took up jogging. Since the beginning, when I started keeping track of my weight loss on Skinnyr back in August, I’ve lost a total of 15lbs, just over a stone (nearly 8kg.) That’s pretty good. I think I’ll re‐start the diet next week, making sure I’m properly well and I’ve had some decent sleep — that always seems to help keep me on the straight and narrow — and go another few weeks before having a week or two off, then try another burst in the run‐up to the half‐marathon, finishing a week or two before the race. 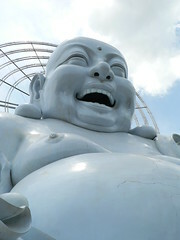 On the whole, excellent news on the fat‐fighting front, I think! Buddha image by amasc on Flickr.